Looking after the wellbeing of young children and helping them foster healthy lifestyles is critical if we are to tackle the growing crisis in child mental health. With hundreds of thousands of school-aged children referred for treatment every year, the practice of improving wellbeing should begin right from the outset of their education, during EYFS. In this post, we’ll look at how outdoor play and the equipment in your playground can help the wellbeing of the children in your care. Just getting the children outside is a step in the right direction if you want to improve their wellbeing. It stops them feeling cooped up, enables them to stretch their legs and move around and puts them in a situation where the normal rules of indoor behaviour are relaxed a little. This makes them feel at ease and less stressed. Being outside also lets nature perform its magic on the children. 15 minutes of daylight hitting their skin produces enough vitamin D to keep them going through the day. It doesn’t even need to be sunny for this to happen. Not only is vitamin D good for the bones, it’s also great for wellbeing. Deficiencies in Vitamin D are linked to anxiety, depression and seasonal affective disorder (SAD), so getting outside can have a positive effect on mental health. Helping children improve their mood is another way to increase wellbeing and the best way to do this is to encourage them to take part in physical exercise. When this is done on a regular basis it helps children to have a more positive and optimistic attitude and to feel more enthusiastic about participation in day to day activities. Exercise has also been shown to have a positive effect on behaviour as it reduces the stress levels that often trigger naughtiness. There are a number of useful pieces of playground equipment that can help EYFS children get active enough to raise heart rates. These include a variety of playground markings for encouraging activities such as hopscotch and skipping or taking part in games like football and rounders. Wellbeing can be improved simply by providing the opportunity to do things which children enjoy and which raise self-esteem. One of the best ways to enable this is to install equipment which is fun to play on and which presents challenges that, when met, make children feel good about themselves. 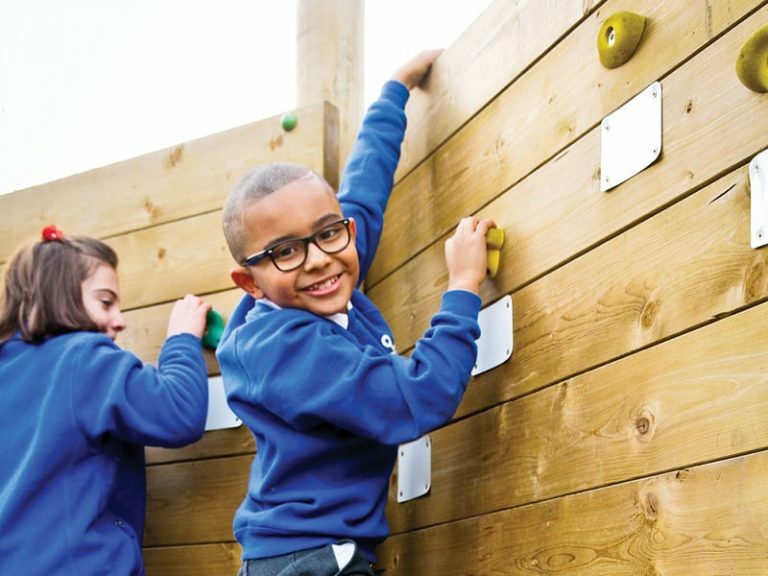 Climbing challenges are ideal for this and there are many pieces of EYFS climbing equipment that have been specially designed for the youngest of learners and which can be combined together to create a bespoke obstacle course. These include a variety of balance beams, net climbers, log strides, tunnels, bridges, slides and various other exciting pieces – all safe for EYFS children to use. 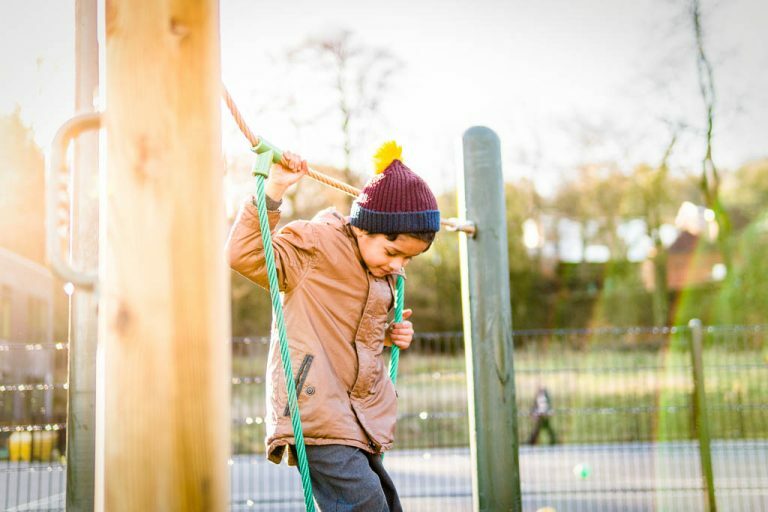 In addition, there are early years’ traversing walls, tree trail coppices and a plethora of low height play towers which are ideal for short legs and big ambitions. When children complete the challenges posed by these pieces, they are rewarded with a sense of accomplishment that will lift their mood and make them feel good for the rest of the day. In turn, this will inspire them to challenge themselves even harder next time. Blue skies, green grass, colourful flowers and birds singing. As adults, we know that getting out into nature, even if it’s just in the garden, can help soothe away the stresses and strains of the day and restore some much-needed calm and balance. Quiet spaces are also good for the wellbeing of EYFS children. Indoors can often be crowded, busy and noisy, so providing an outdoor space just to sit and enjoy the quiet and the natural world can enable children to unwind and recharge. This can be achieved by creating a nature garden using planters, trellises, a few outdoor seats and even a water feature or a wind chime. 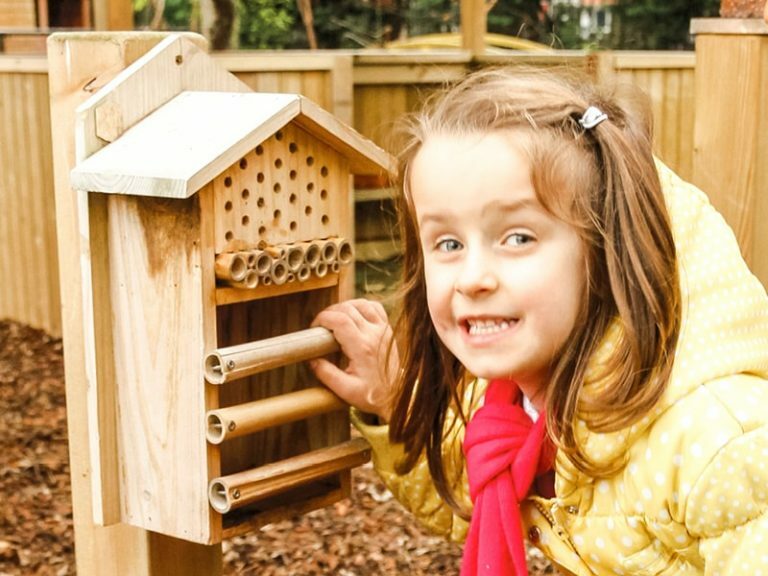 Adding bird tables and bug houses also encourages wildlife into the space, bringing a sense of awe and wonder that can help children develop an appreciation of nature. The new Draft Ofsted Inspection Framework 2019 puts increased emphasis on wellbeing with EYFS providers now being judged on their ability to help children “know how to keep physically and mentally healthy”. This is essential not just because of the current mental health crisis but because of the immense pressure children will face as they move on to primary and secondary schools. This pressure puts children under a great deal of stress and can exacerbate mental health problems if they are not taught coping strategies and given the opportunities to carry them out. At the EYFS stage, learning about how to keep physically and mentally healthy often comes through experience. Children will feel better about themselves when they participate in physical outdoor activities or learn how to relax and unwind. Providing them with the opportunities to do this is a key way to ensure EYFS providers meet their Ofsted obligations. With nurseries and EYFS providers having to take more responsibility for the wellbeing of children, providing well equipped outdoor spaces where fun physical activity or relaxation can happen will help reduce stress, improve mood and increase self-esteem. These activities can also be used to teach children how to look after their wellbeing in the future.